I thought this was interesting - over the past couple days, Andrew Breitbart and Big Government have been spending a lot of their time on the hacking of New York Democrat Anthony Weiner's Twitter and Facebook account. Breitbart claims his websites are conducting some fair reporting. What we know is that a link to a lewd photo was published from a sitting Congressman’s Twitter account, directed at a female recipient, whom he was “following,” but visible to everyone. Two broad possibilities exist: (1) the Congressman’s Twitter account (and perhaps other accounts) were hacked, or (2) the Congressman or someone with authorized access to his Twitter account sent the photo. From here, we think the story most immediately goes two places: forensic analysis to determine the veracity of Congressman Weiner’s hacking allegation, which certainly bears criminal implications; and investigation into the veracity of developing reports of young women among the relatively few people Congressman Weiner “followed” on Twitter and who now claim they had direct communications with him. Certainly, getting to the bottom of the story has been made more difficult by the relative silence of Congressman Weiner, as there remain many open questions he has not addressed and on which the mainstream media has failed to press him. Breitbart's comments seem to be contrary to what has been published on his websites - the Big Government editorial board has spent a lot of time speculating about this situation. I am not sure if Breitbart is aware of this but speculation is not "the facts of the story in a fair and accurate way." "Hacked or hung?" wrote Big Goverment on May 28th. "Is this the Tweet in question? Was Weiner hacked?" Later, on Monday, when Rep. Weiner's spokesman used the word "prank" instead of "hack," Big Government again thought this was an opportunity to speculate. The latest statement from Rep. Anthony Weiner’s spokesman on the Weinergate saga makes a subtle but perhaps important rhetorical shift. Could that change reflect an attempt to walk back earlier “hacking” accusations? Big Government is now trying to cast doubt on the possibility of a hacking and make people believe it was an inside job, or worse, Weiner himself. Why is Big Government devoting so much time to this incident? 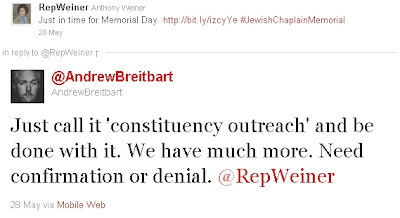 Could it be because Rep. Weiner has been very outspoken against the right-wing propagandists like Breitbart? Breitbart, desperate to maintain public interest in his smear campaign, had been taunting Rep. Weiner, claiming he had "much more," but needed "confirmation or denial." It is interesting since Breitbart basically admitted he knows nothing of what is going on, despite claiming to be reporting facts of the matter. Why is Breitbart holding onto information now when he had repeatedly published unvetted information in the past? It makes you wonder if Breitbart is a little too involved in this "prank" or "hack." There are also some reports that the image Breitbart was using as proof - a screen grab - was doctored, according to this website offering an error level analysis of the image. Basically, Breitbart is trying everything to discredit one of the Republican's biggest targets, but nobody is biting because Breitbart has proven to be a journalistic hack.